Jordbro Burial Ground and its neighbor, Åby Burial Ground are enormous burial and cultural locations at least a thousand years old, from the end of the Bronze Age to the middle of the Iron Age. At the end of the Iron Age, people began to cease burying their dead in in bigger grave mounds, but interred them in smaller grave grounds on their own farms. This time period is generally called the Vendel Era (550-800 AD) and the Viking Age (800-1050 AD). It became important to have your ancestors close to home. 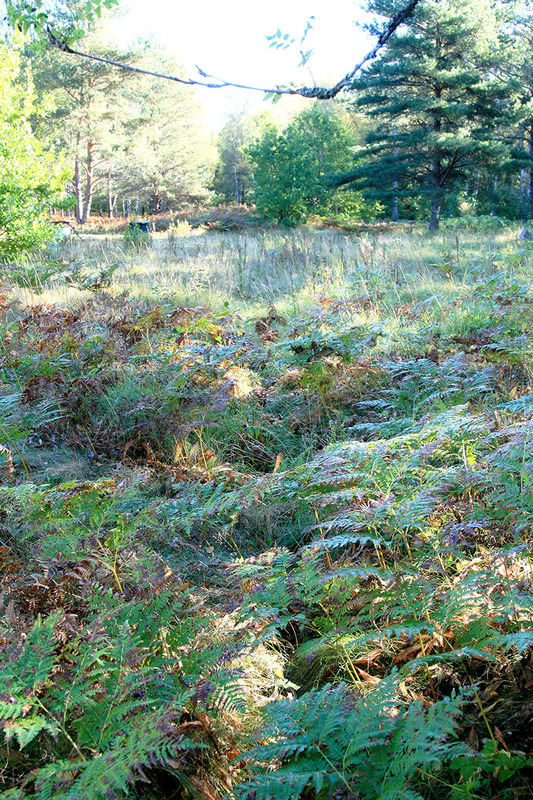 In the photo, you can just make out the trench road under the ferns at the bottom center and curving off to the right. Far back in the distance by the small green tree, you can just see the little burial mound, most probably from the younger Iron Age.